Hargate Hall is not run as a hotel, it is a family owned and run property in the Peak District. When you book us as your Derbyshire Wedding Venue it will become your house for the weekend, where you can get married and then celebrate with your friends and family. There are no ‘one size fits all’ wedding packages. We provide the wedding venue and accommodation and then with our help and advice on all the other ingredients of a memorable occasion - food and drink, music and dancing etc - you make your own dream a reality. 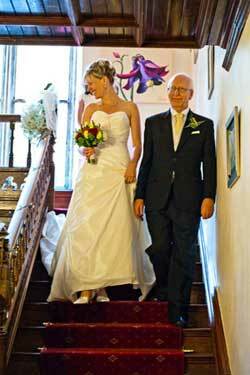 Weddings are family occasions, and all your guests, of every generation, should feel comfortable with the venue. Children and babies are more than welcome here and we have facilities here to ensure that they always have a great time. We can also offer you a wedding planning service. Working with a select group of local suppliers, we can organise as much or as little of your wedding as you like. If you would like to know more, then please contact us. When choosing Hargate Hall as your wedding venue, it becomes your house for the weekend. You will have it from 4pm on the Friday to 10 am on the Monday. This can be extended if required. We aim to be as flexible as we can in how you run the weekend, so your guests feel that they are at your home rather than a hotel. Most of this website talks about weekend weddings, however we are now offering special Midweek Wedding Packages. Please contact us for further details. We are licensed to hold civil wedding ceremonies . For the ceremony, the main hall can hold up to 76 seated or up to 140 with a mix of seated and standing. Civil wedding ceremonies usually take place in the main hall. We are quite flexible about where you place the marriage table and seating, depending on the size of your party and whether the bride would like to enter from the front door, the main stairs, the side entrance or one of the apartments. Everything is very friendly and relaxed. Weather permitting you could consider getting married in our small summer house, with your guests being able to stand in the grounds looking on. Your reception drinks can also takes place in the main hall or, if the weather is fine, outside in the gardens where there is plenty of seating and beautiful views or any where else you want. This is also the time for photographs, and you will find plenty of lovely settings in and around the house for group and family shots, as well as more intimate and informal moments.